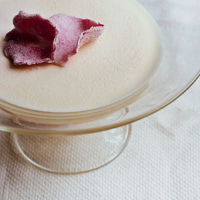 Use pretty red or dark-pink damask rose petals to decorate this creamy pudding and really bring out its luxurious side – and try to obtain them from a garden that has not been sprayed with pesticides. To make the crystallised rose petals, pick up a petal with some tweezers, dip in the egg white and then in the sugar, coating it well. Place on a wire rack and repeat with the remaining petals. Leave to dry in a warm place – try an airing cupboard – for 4–5 hours. Put the ground almonds in a bowl. Heat the milk to boiling point, pour it over and leave to infuse for 2 hours. Strain the milk through a fine sieve, squeezing every last drop out of the almonds with a spoon. Discard the almonds or save for a bakewell tart. Measure the milk, topping it up to 600ml with fresh milk if necessary. Whisk the sugar and egg yolks together in a separate bowl until the mixture is pale and thick. Bring the almond milk to the boil and whisk into the egg mixture. Return the mixture to the pan and cook, stirring, over a very low heat until it thickens enough to coat the back of the spoon lightly; make sure it doesn’t boil. As soon as the mixture has thickened, pass it through a sieve into a bowl. Meanwhile, soak the gelatine leaves in cold water for about 10 minutes.Squeeze the excess water out of the gelatine and drop the leaves into the milk mixture. Stir until dissolved. Sit the bowl in a second, larger one filled with iced water and stir till the blancmange begins to thicken. Fold in the cream, then divide between 4 glasses and put in the fridge for 2 hours until set. Scatter a few crystallised rose petals over the surface just before serving. The delicacy and perfume of this classic dish give you a chance to serve a finely balanced dessert wine.